Messenger bots are robots that can carry on a conversation with a customer. They interact with them just as an actual human being would. They can handle small customer service tasks, process payments, book reservations, and more. Online users are already becoming familiar with these types of bots every day. They appear on so many websites in the form of chatbots that pop up when a user lands on the site. Messenger bots are different than these chatbots though. This is because they don’t appear on websites but instead, inside messaging apps such as Facebook Messenger. Facebook is the largest of the messenger bot market. They are also in Twitter, WhatsApp, and more. Whenever a customer wants to message your business through these apps, the messenger bot will appear. The customer will then subscribe to speak to the bot. If your local business doesn’t currently have one, you could be missing out. The biggest reason for this is just that - so many local businesses are using them! And that includes your competitors that may be just down the street, or just around the corner. If you’re not, and the competition is, customers may decide to leave your company when they can’t get a hold of you right away, but there is always someone (or something) to talk to them at the competitor. 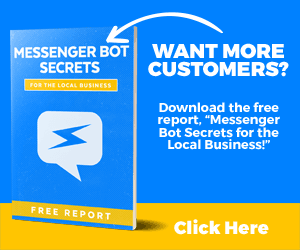 Local businesses that don’t begin using messenger bots now are simply going to be left behind. It’s said that by the year 2020, and that’s not too far off, 85 percent of business to customer interactions will be done with no human interaction at all. At that time, there’s no telling just what messenger bots will look like, interact like, and what other advancements will be made. Local business will do much better getting in on this trend now instead of finding out too far down the road that they waited too long.